The Quraysh of Makkah did not stop from harming and oppressing Muslims even after they migrated to Madinah. In order to stop further migration, they started torturing the Muslims, willing to migrate, sometimes forcibly stopped them and many times they snatched every thing from them. Instances showed, they even snatched their dresses and few people managed to migrate undressed and in a very miserable conditions. Not only this, they even threatened people of Madinah and their leader Abdullah Ibn Ubayy for their support to the Muslims Muhajirin. These were not mere threat and warnings. The Prophet (peace be upon him) knew the extent of the threat from the Quraysh of Makkah and he used to spend his nights without sleeping or sometimes sleeping with some of the companions guarding him. �The Prophet was vigilant one night and when he reached Medina, he said, "Would that a pious man from my companions guard me tonight!" Suddenly we heard the clatter of arms. He said, "Who is that? " He (The new comer) replied, " I am Sad bin Abi Waqqas and have come to guard you." So, the Prophet slept (that night)�. This is also to be mentioned that this was not just for few nights but it was routine and usual for the companions (Ridhwanulllaho Ta�ala Unhum Ajm'aeen) to guard the Prophet (PBUH). �O Apostle! Proclaim, the (Message), which hath been sent to thee from thy Lord. If thou didst not thou wouldst not have fulfilled and proclaimed His mission: and Allah will defend thee from men (who mean mischief). For Allah guideth not those who reject faith�. Also, the danger was not just for the Prophet (PBUH) but all the Muslims were in danger. Ubayy bin Ka�b reported that since the migration of the Muslims to Madinah and the protection they received from Ansars, the whole Arab world united against them and therefore Muslims neither spent their nights without arms nor met the morning without arms. �To those against whom war is made permission is given (to fight) because they are wronged and verily Allah is Most powerful for their aid�. �(They are) those who if We establish them in the land establish regular prayer and give regular charity enjoin the right and forbid wrong: with Allah rests the end (and decision) of (all) affairs�. With the permission for the war, the Muslims planned to teach the Quraysh of Makkah few lessons. The Quraysh of Makkah had to pass their caravans through the suburbs of Madinah while going towards Syria, a market place. Muslims threatened to disrupt their caravans so that they could realize their mistakes and learn to live in peace with the Muslims. Still, the Quraysh of Makkah did not repent for their aggressions against Muslims and hence the Muslims decided to attack their caravans. 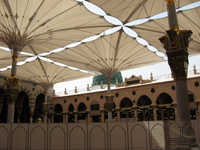 Some confrontation did occur between the Muslims and the caravans of the Quraysh before the Battle of Badr, but there was neither any bloodshed nor any looting till the Quraysh, led by Karz bin Jabir Fehri, attacked cattle-field near Madinah and looted and took some of the cattle belonging to Muslims with them. It is not fare, therefore, to think it was economical reason behind the looting of the caravans. The Prophet sent twelve Muhajirin, led by Abdullah bin Jah�sh, after this incidence and ordered them to go to the passage between Makkah and Ta�if and to search for the caravans of the Quraysh. Abdullah bin Jah�sh led them to Nakhla after traveling a long distance from Madinah and attacked the caravan, capturing two prominent among them and killing Amr bin Hazrami. These were the first of killed, occupied and booty in Islamic history. The attack made the Quraysh panic but they were furious of the way Muslims attacked their caravan near Makkah and after traveling three hundred kilometers. This, they feel as a setback and shame for their pride and myth and decided to attack and thwart the Muslims staying in Madinah. �Fight in the cause of Allah those who fight you but do not transgress limits; for Allah loveth not transgressors; And slay them wherever ye catch them and turn them out from where they have turned you out; for tumult and oppression are worse than slaughter; but fight them not at the Sacred Mosque unless they (first) fight you there; but if they fight you slay them. Such is the reward of those who suppress faith; But if they cease Allah is Oft-Forgiving Most Merciful; And fight them on until there is no more tumult or oppression and there prevail justice and faith in Allah; but if they cease let there be no hostility except to those who practice oppression�. With this the Muslims realized that a battle with the Quraysh of Makkah is in waiting and ultimately it took place on Friday, Ramadan 17, two years after Hijrah and March 624 AD at Badr, near Madinah. This was the first full-fledged battle with Quraysh of Makkah and remembered as �Ghazwa�e Badr- The Battle of Badr�.